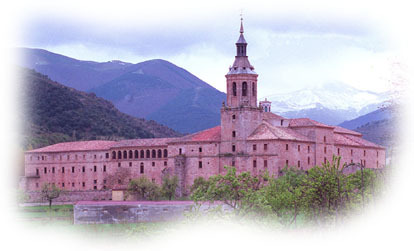 The monastery of Yuso is located in a small valley in the mountains: the valley of the river Cárdenas. The architecture of the great monastery Yuso and the garden walls of what was it´s ample vegetable garden can be appreciated. This mass of masonary, renaissance and baroque construction shows a notable difference from the singularity of Suso, a little monastery that appears framed by the dense vegatation of the mountain.